As the prevalence of stronger, more devastating wildfires arise around both the country and the world, it is necessary to mitigate the after-effects of wildfire damages to the landscapes they envelop. 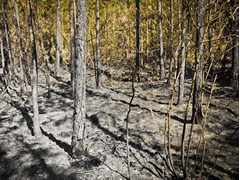 Following a high-intensity wildfire, the rate of erosion can increase and remain imbalanced for years at a time because of the devastated understory. Post-fire debris flow brings with it ash transport containing elevated levels of nitrates and phosphates from the volatilized plant matter consumed by the fire. Erosion-susceptible regions have higher levels of ammonia, nitrogen, and phosphate, in the surrounding water bodies because of this debris flow. Also, elevated sediment levels are toxic to aquatic and human life and it is necessary to decrease the rate of erosion and engage in preventative measures following a forest fire. 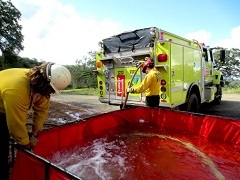 GEI Works provides a variety of durable and portable water storage tanks for firefighting including onion tanks, frame tanks and water trailers to assist in wildfire mitigation. After a forest fire of any magnitude, it is necessary to consider erosion control mitigation in the weeks, months, and years following. The first sizeable storm after a fire will cause a debris flow that will push wood ash or black ash into nearby waterways, along with downed trees, branches, and heavier matter. This happens as a result of a change in hydrology in the landscape following a wildfire; high-intensity fires cause top soils to become hydrophobic, repelling water and leading to increased runoff. Would you like to know more about post-fire erosion control solutions? Call our technical team at 772-646-0597! Coir Logs and Wattles are valuable tools to slow the rate of erosion in most regions. When terraced, these fiber rolls prevent water runoff from gaining speed by blocking easy flow paths across the surface. Fiber rolls trap sediments and provide filtration. An important benefit of using these products for erosion control post-fire is that they can be left onsite to break down and help new plant growth take root. Coir mats trap sediment during sheetflow and help mitigate loose or contaminated soil from eroding further. Coir mats help trap black ash, top soil, and other particulates in the fibers instead of flowing away with water runoff. Similar to Coir logs and wattles, new plant life can be seeded or allowed to let natural growth take root in the biodegradable coir mats, making this a long-term solution to erosion concerns. Coir mats can work in conjunction with coir logs, as the logs will slow the flow of water, provide filtration, and the fiber mats trap additional sediments and protect unstable soils from washing out into adjoining water bodies. 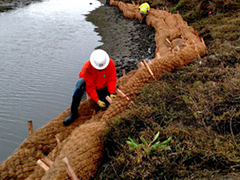 A silt fence can be quickly deployed along the outer perimeter of the damaged region and, when properly installed, can be used to slow the flow of water and trap silt within the impermeable geotextile filter fabric. These are a simple, inexpensive, temporary solution to erosion concerns following a wildfire. They are not meant to be left on-site permanently and must be removed after other erosion control measures are in place, and the fire damaged site is stabilized. Ditch Checks slow down the speed at which water flows through an area. Ditch checks should be placed higher up in an at-risk watershed, to provide a decrease in flowrates and provide an initial filter for sediment and debris contaminated flow. Multiple ditch checks can be used in succession, to decrease overland flow to stop while filtering out sediments and ash from a burned swath of land following a storm. Sediment deposited into streams, rivers, and waterways are toxic to aquatic life as they can clog or damage the gills of fish residing in these water bodies. Plus, this ash can pollute water reservoirs further downstream and change pH levels, inhibiting plant and micronutrient production and making the water uninhabitable by species native to the area. Turbidity curtains decrease the spread of wood ash, silt, and sediments. These particulates are contained inside a floating PVC barrier with a curtain that hangs below the surface to slow the water and allow time for the particulate matter to settle out naturally. GEI Works carries Type I and Type II Curtains in-stock and are ready to ship on-demand, as well. Fallen trees, branches and debris left after a wildfire may enter a waterway in the next large storm. GEI Works recommends using heavy duty or permanent debris booms to prevent larger objects from clogging waterways or posing a safety and health risk to structures within the water, boaters, and swimmers. Standard debris boom can be utilized to divert, collect or contain debris floating on the surface of water bodies. Do you have questions about mitigating post-fire erosion? Call our team at 772-646-0597 to find out more, or request a quote!